In all, we have 140 chamber-years of new data. These now include party data for Nebraska thanks to friend and coauthor Seth Masket, who generously provided the informal but well-known partisan affiliations for Unicameral legislators. The individual level data underlying this release has been extensively cleaned to minimize the random noise inherent in acquiring roll call votes from printed journals. 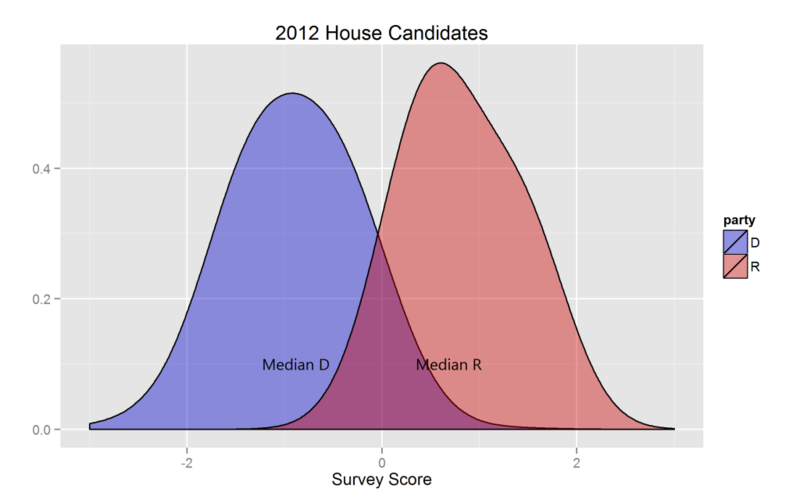 I recently posted the graph of my estimates of the two parties’ congressional candidates. In that post, I wanted to emphasize that moderation still exists, even in this polarized age. 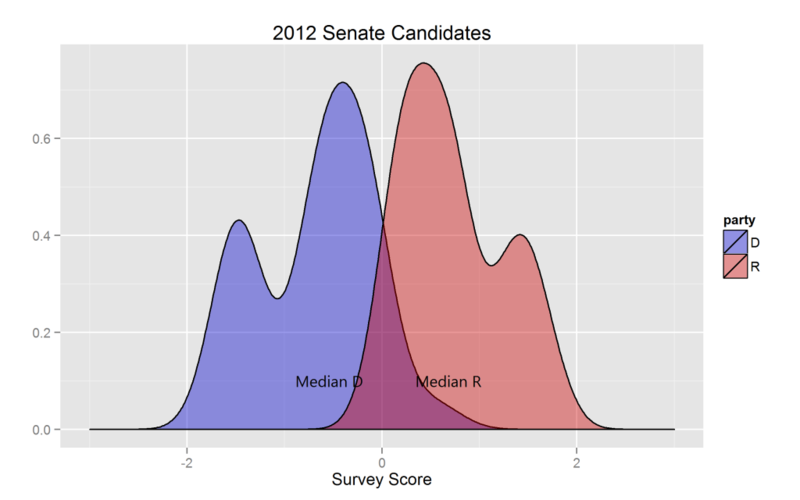 To highlight that point and make the plots prettier, I smoothed out the distributions. No, those aren’t Halloween ghosts. 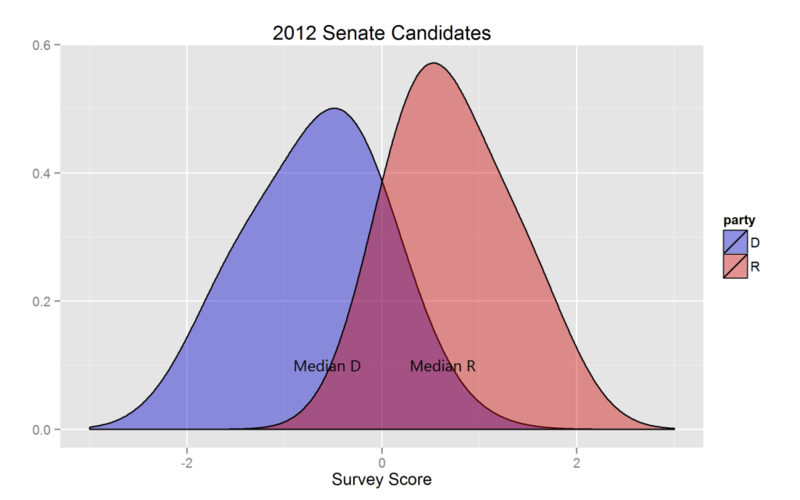 It looks like both parties have two distinct wings, a moderate one and an extreme one. This visual inspection is backed up by test statistics from the Hartigan dip test for unimodality. 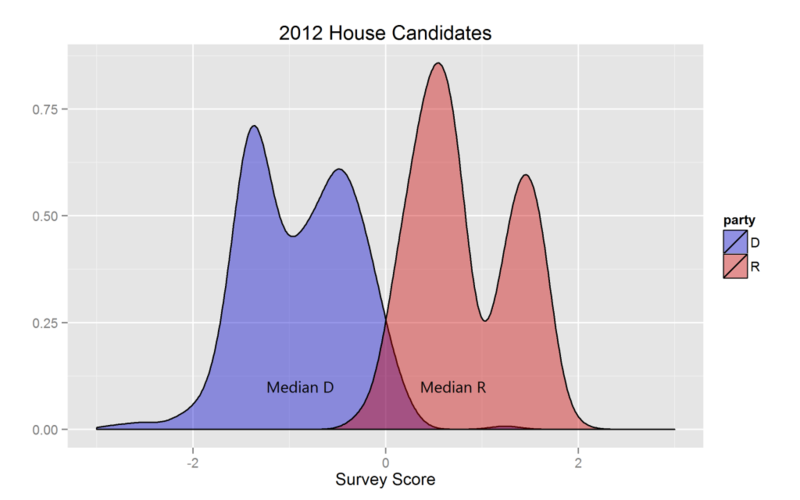 Feel free to download the estimates for all the 2012 congressional candidates here. The explanation of how I generated them is here. We haven’t seen this before in roll call-based ideal point estimates, and I don’t think I’ve seen it before in previous years’ survey estimates (this is something I need to go back and check). So this could be something new under the political sun. What could be causing this? Perhaps new electoral forces like the Tea Party on the right and Occupy Wall Street on the left are forcing candidates to pay lip service to dogma in some new way. And what happens after the election? Will this internal schism go away? Or does this presage a new battle between liberal liberals and liberal moderates, and between conservative conservatives and conservative moderates? Your guess is as good as mine, though. Any ideas?